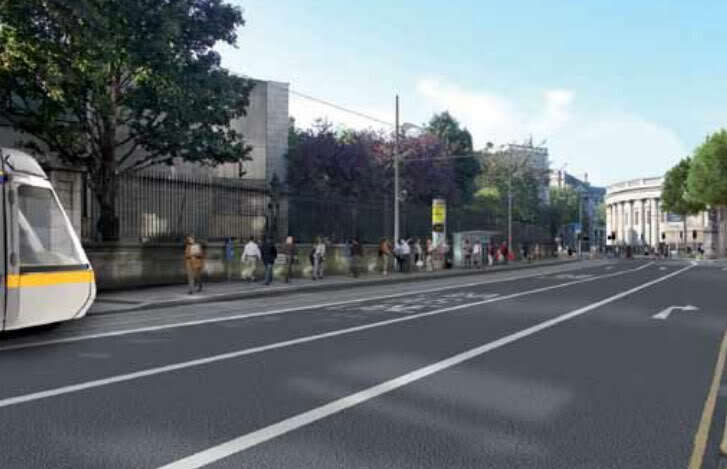 Luas photomontage: No more cycle lane on Lower O’Connell Street? Before and after the upcoming local elections, candidates and councillors across Dublin should be under pressure to ensure officials get the design right for the Luas Cross City tram route. People need to demand that the conditions for walking, cycling and street life on some of our capital’s most central streets are improved. The Luas Cross City track alignment is likely set in stone at this stage — give or take a few meters in most cases. But everything around the tracks is not set yet. How the final street layouts will look — including space for walking, cycling and city life — is still being discussed by Dublin City Council, the National Transport Authority and the Railway Procurement Agency. The RPA confirmed to us that these final design have yet to be drawn up. The National Transport Authority draft plan for the city centre (a leaked copy of which we published here) includes an outline of part-pedestrianising College Green — but that has not gone beyond draft status yet and has not been debated widely. 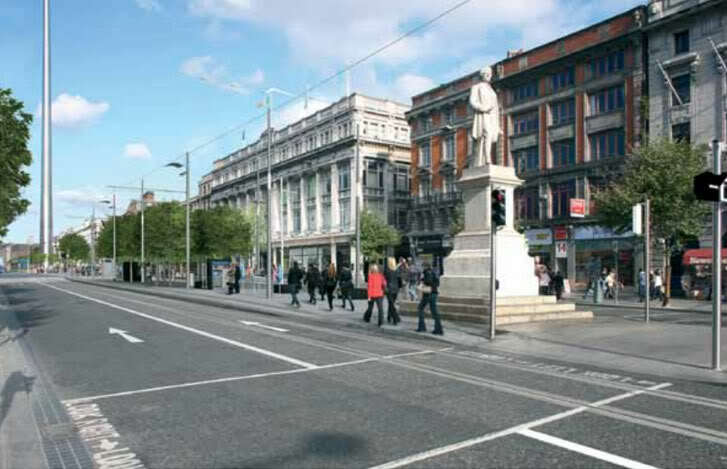 But regardless of what street changes make it into the final street layout plan for Luas, it seems unlikely that the city will tolerate changes to the route area for after years of Luas construction, so the time to push this College Green plaza idea is now. Apparently no space for cycling on C0llege Street? The same is the case for more subtle detail of street design. The kind of detail which is often dismissed as small fry but it can have a profound affect of making the streets and the overall city centre more or less liveable and sustainable. For example, diverting people on bicycles around one-way systems will lower the chances people will cycle and will make conditions worse for those who already do. We’re talking about the streets with some some of the highest pedestrian footfalls in the country and largest amounts of people cycling — where bicycles account for 8% of traffic across the city centre and nearly 20% on Dame Street. In 2011 when DIT researchers asked Grafton Street shoppers: What is the main mode of transport you used to get into the city centre today?”, 8% on said they cycled. This has likely increased since as cycling has become more popular and this will continue even if the city only gets half way to its target cycling modal share of 25%. Dublin City Council’s Public Realm Strategy was supposed to support giving space and priority over to walking and cycling in the city centre, but progress has been slow on the ground. The Luas works are an opportunity to get things right. A wider footpath on the west side of O’Connell Bridge to take the high volumes of people crossing the city at this point. And wider crossing than the current standard around the city centre. Dedicated, segregated space for cycling on the wider streets along the route. With for example, the current eight lanes and a taxi rank on O’Connell Bridge; four lanes plus parking on D’Olier Street; and five lanes plus parking on Westmorland Street; there’s little room for excuses that there is no space for segregation. People should be allowed to safely cycle in this core city centre area without the fear of buses and other traffic around them, often at speed. Cycling both ways on as many streets as possible, even one-way sections (aka contra-flow). Key examples are Parnell Street at Parnell Square without diverting uphill around the large square; and the north-west corner of St Stephens Green leading into Grafton Street; on Grafton Street between Nassau Street and College Green; and on Dawson Street. Alternative routes around the Luas route between St Stephens Green and College Green. A few points on this section are set to become a tram and bus bottleneck. While allowing cycling access in this area is vital, making faster routes around it could be beneficial in removing many cyclist-tram conflicts and providing permeability for cycling. On the west side of this area, South William Street and nearby streets could be candidates to be made two-way for cycling or Great George’s Street could be given segregated cycle paths of it was made public transport and access only. There’s many other details which are small thing but could and should be fixed before Luas Cross City is finished. In 2012 we covered the changes expected with Luas Broombridge (since renamed Cross City) and we made some suggestions. Policy after policy, and plan after plan indicates that walking and cycling will be give space and priory — this however needs result in on-street changes soon, not in ten year’s time. We should not looking for councillors or city officials to fix things after Luas Cross City is up and running. The time to act is now.